BANGOR, Maine — All discretionary salary increases for University of Maine System employees have been suspended, Chancellor James Page said Thursday evening in the wake of news that 44 University of Southern Maine employees received $242,000 in raises during a difficult fiscal year. The system plans to do a full review of salary increases at each of its campuses. System spokeswoman Peggy Markson said she should have a better idea Friday of how long that process will take. The Press Herald first reported on the salary increases earlier this week. The 44 USM employees saw their salaries boosted between 5 percent and 41 percent under the Salaried Employees Compensation and Classification Program, which allows the employees to have their positions reviewed to determine if their work warrants higher pay. The program was established in 2005 to compensate system employees for increases in workload and not to bring salary levels to the same level as other universities in the nation or University of Maine System, according to Tracey Bigney, the system’s chief human resources officer. Since 2007, USM has lost an equivalent of 118 full-time positions, which have either remained unfilled or been eliminated, according to USM spokesman Bob Caswell. Many of those roles and duties had to be passed on to other individuals, who saw an increased workload, many times at less cost than refilling the empty post, Caswell said. Monique LaRocque, USM’s executive director of university outreach, received a $34,515 raise this year under the program — a 41 percent increase over her previous salary. She now makes $118,000 a year. That raise came after LaRocque’s boss left for a different job. Rather than filling the position, USM eliminated it and passed its responsibilities to LaRocque and others in the office. Caswell received a $18,212 raise after his position was reviewed. He attributed the 21 percent salary increase to the fact that he took on a number of duties outside of his original job description at the request of USM President Selma Botman. His salary is now $106,000. Those duties included leading high-level campus task forces, taking on responsibility for coordinating internal communications, coordinating community events on campus and providing strategic counsel to the president, Caswell said. “When you look at the overall goal of compensation, it is to attract and retain qualified staff,” Bigney said, adding that the system’s salaries are low when compared to U.S. universities. Bigney said the system looks at national market data when determining salaries, but only to determine where an employee should fit on the system’s pay scale. The timing of the raises at USM has come under fire from system faculty and state legislators. Caswell said he understands why people would question the awarding of raises during a time of repeated budget cuts and fiscal trials. Rep. Kenneth Fredette, R-Newport, a member of the Legislature’s Appropriations Committee, said the raises seem inappropriate in light of recent cuts across higher education. 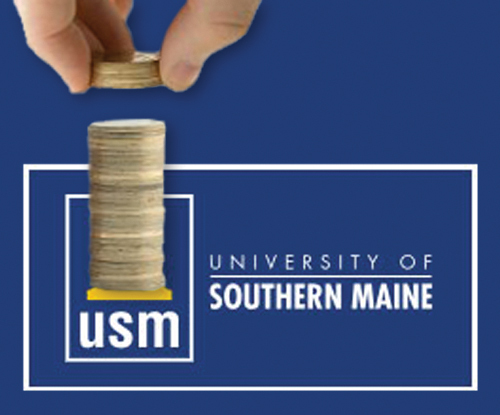 USM is trying to determine where to cut $5.1 million out of its budget. Gov. Paul LePage’s proposed budget would cut an additional $1.8 million in funding to the University of Maine System. Bigney said the Salaried Employees Compensation and Classification Program applies to nonfaculty salaried employees in the system. James McClymer, University of Maine at Orono associate professor and vice president of Associated Faculties of the Universities of Maine, said he hadn’t heard of the program before seeing the news of the salary increases. “It does seem that a group [of employees] is being singled out through a process that most people don’t know about, including us,” he said, adding that members of the Associated Faculties of the Universities of Maine have gone almost three years without an across-the-board salary increase. The system has yet to release salary increase numbers from its other campuses, but is working to gather the information.